Exhibition runs October 30th through November 14th. Thesis-year media student Sid Branca’s work exists at the intersection of pop culture, classical tragedy, and fictionalized autobiography, drawing on their parallels in a pastiche-driven practice. Her current line of inquiry is a body of work framed as the creative output and documentation of a fictional pop star, Elektra, inspired by both the pantheon of popular music icons and the tragedies of classical Greece. THE NEXT GREAT AMERICAN POP ICON WILL SPRING FULLY FORMED FROM THE HEAD OF ZEUS is a durational, sculptural performance through which Branca will develop this character: how she dresses, does her hair, paints her face, carries her body, speaks, sings, dances, poses, writes, breathes, thinks. This performative sketching process will be constantly filmed and reviewed as she manipulates herself as live sculpture, using costume, set, prop, makeup, movement, and sound. 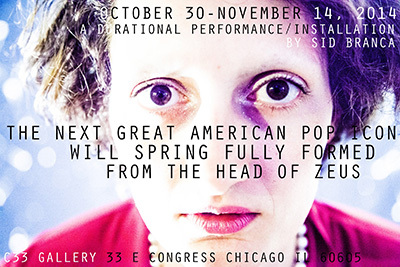 This exhibition was selected by Columbia College Chicago’s Department of Exhibitions, Performance and Student Spaces (DEPS), with Cassandra Troyan as Exhibition Coordinator.